Deal With The Issues Today-CHAB Schools, Siem Reap. HOW TO SUPPORT OUR SCHOOLS? 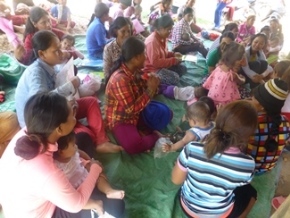 Nutrition Result: Malnutrition is perhaps the greatest development challenge affecting in Cambodia. Of children under 5 years old, 40% are stunted through chronic malnutrition, 28% are underweight and 11% wasted. Although some progress is evident in event years, malnutrition rates remain stubbornly and alarmingly high. CHAB works closely with the authorities, villagers and health centers of government to reduce maternal, infant and child mortality by accelerating improvements in delivery and demand for health services, improve child development by combating hunger and minimizing the negative consequences of malnutrition on children. Our approach of malnutrition at CHAB to help them protect children from infection and disease. Working with communities to help them protect children from infection and disease through improved management of diarrhea and better access to clean water and sanitation. Helping families to develop year-round access to nutritious food. Supporting caregivers in adopting improved feeding practices for infants and young children. The infant mortality rate has declined from 95 to 45 deaths per 1,000 live births, setting Cambodia on track to reach its Millennium Development to reduce child mortality. CHAB provides free health care and nutrition solutions to poor countryside children and villagers. The CHAB's free health care services have reduced an extreme poverty in the community of CHAB's project. The children's health care aims to help parents develop a strong bond with children encourage care that keeps children healthy and safe, protect children from serious diseases. The children's health care we work with medical volunteers who have skill and experience many years with national and international organizations. We cooperate with primary school principle and authorities. Poverty leads to a lack of materials and knowledge for proper sanitation and hygiene, causing Cambodian children to still suffer from high rates of infectious diseases such as diarrhea and pneumonia. Poverty is also an important barrier to other more direct causes of mortality: proper nutrition and health care. Tackling poverty and reducing financial barriers to health care require new approaches and different strategies to help save children’s lives. health care utilization continue to persist between rural and urban areas in Siem Reap between people with different educational levels. Despite reductions, poverty remains one of the most important underlying causes of high maternal and child mortality and under nutrition. One in three Cambodians still lives below the poverty line and 20 per cent of Cambodians cannot afford enough food. Progress has been attributed to successful immunization programs and breastfeeding promotion, and factors such as poverty reduction, improved education and better roads. Nevertheless, child mortality levels in Cambodia remain high by regional standards. Every day, an estimated 50 children under five die, mainly because of preventable and treatable diseases, such as diarrhea and pneumonia.